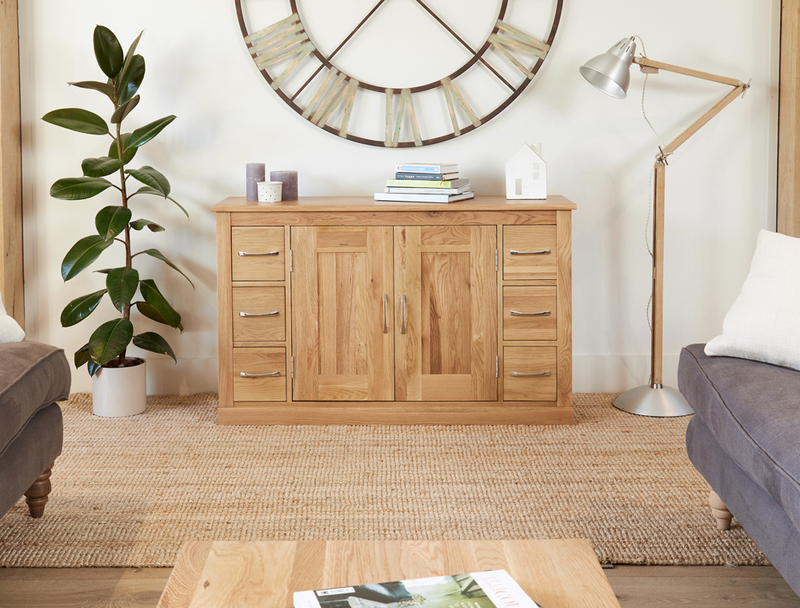 To add a contemporary finish to your home plus a little warmth and natural beauty, look no further than our best selling Mobel Oak furniture range. The collections slimline brushed steel handles and minimal embellishments lend themselves beautifully to modern surroundings. 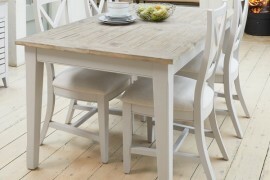 Each piece is delivered fully assembled, is made from high grade solid oak and finished with a resilient satin lacquer. 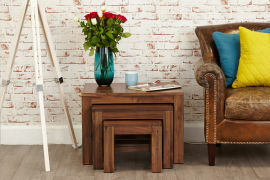 Whatever you’re looking for, the range has a broad selection of products for every room in your home including TV cabinets, coffee tables, home office desks and shoe storage cupboards. We’ve commissioned some new photography of the Mobel Oak collection and we’re delighted with the results, so here’s a pick of some of our favourite pieces. Any room would benefit from having this handsome Mobel Oak large bookcase in it. 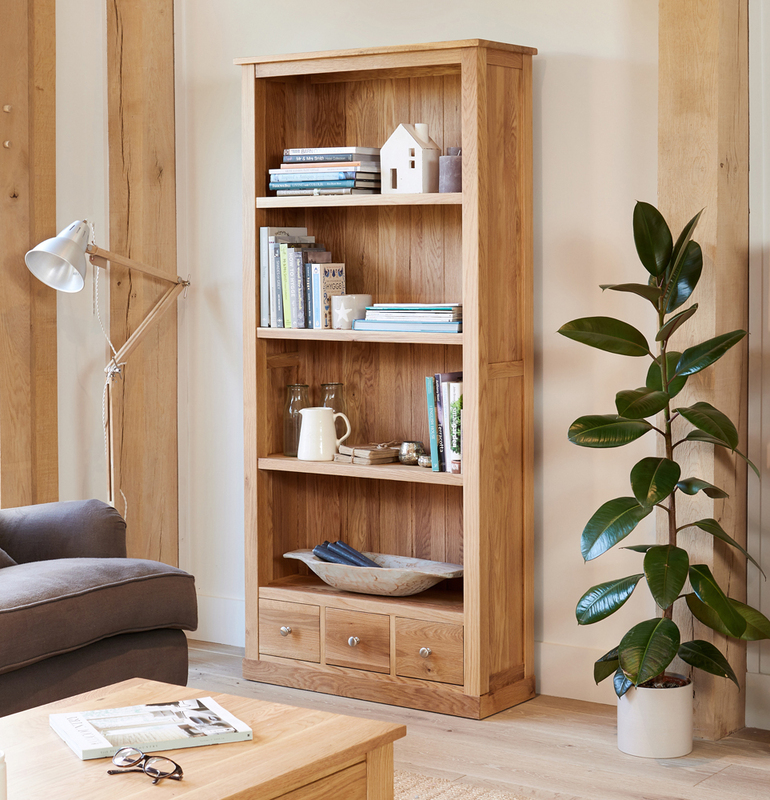 Crafted from solid oak, it’s four sturdy shelves will make an ideal home for your book collection and it also has three drawers at the bottom for extra storage space. 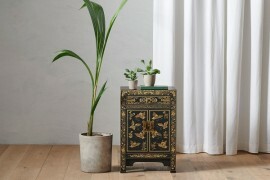 It’s been finished with a satin lacquer to ensure that the rich grain of the wood shines through and it’s simple design is highlighted with the tongue and groove back paneling. 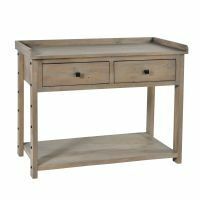 Fill the Mobel Oak sideboard with table linen and cutlery in the dining room, alternatively load it up with stationary, board games and DVD’s in your living room or use it to make a real statement in your hallway. Wherever you put it, this impressive sideboard will exude contemporary style and has generous storage with a double cupboard and six drawers. The wide top is a perfect display space for family photographs and a vase of flowers. We think that your home office space should be as beautiful and as welcoming as everywhere else in your home. 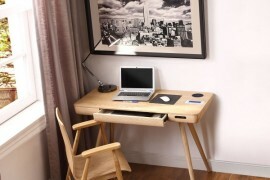 That’s why we love this gorgeous Mobel Oak twin pedestal desk that has everything a “Home CEO” needs to be productive. 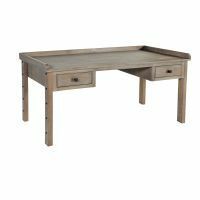 The expansive surface area of the desk has plenty of room for a laptop, phone and in trays, the roomy cupboards and drawers will keep paperwork, stationary and files organised, plus a slide out drawer is perfectly designed for a keyboard. The Mobel Oak range of desks comes in four different sizes and is complemented by coordinating filing cabinets, printer cupboard and wall shelf unit. As we may have said before, a nest of tables is a must have for any home. 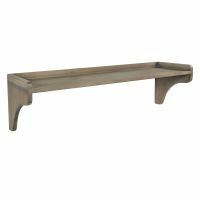 Use them as a perch for a drink, a surface for a card game, an end table for your sofa or a lamp table. Made from solid oak, this handsome trio from the Mobel Oak range feature clean contemporary lines and have a satin lacquer finish to protect them against everyday knocks and bumps. 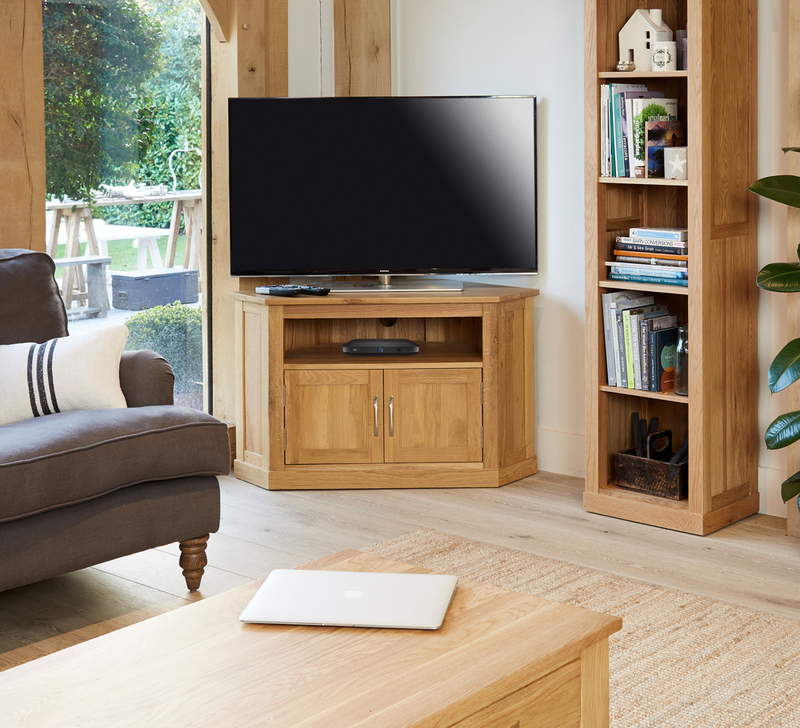 Tucked away neatly in a corner, the Mobel Oak TV cabinet is designed to make the most effective use of space and is perfect for a smaller living room. The unit holds a widescreen television up to 50″ wide and the open shelf underneath has plenty of room for your digital receiver, whilst the large cupboard underneath will help keep all your cables, handsets, games consoles and remotes organised. 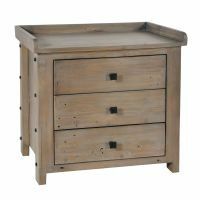 Carefully made from solid oak, this lovely piece of furniture has contemporary steel bar handles and is treated with a hardwearing lacquer to bring out the rich grain of the wood. 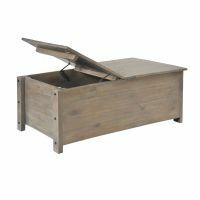 This handy storage chest has ten drawers which will keep you CD and DVD collections neatly organised (it hold up to 300 CD’s and 70 DVD’s). 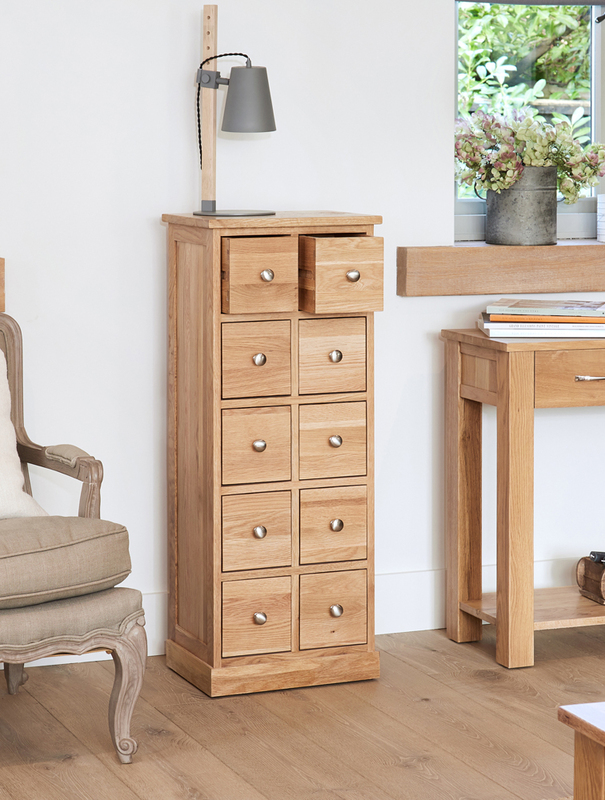 Made to last from solid oak, it has clean lines and stylish brushed steel drawer knobs, it’s an eye catching piece of furniture that would look smart in any contemporary living room. 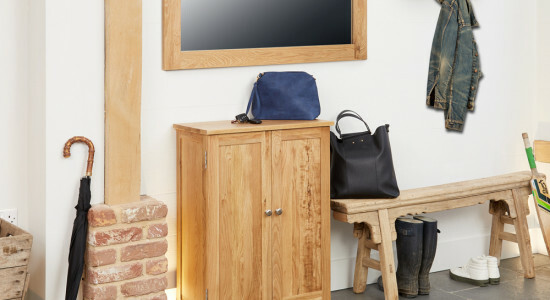 A round up of Mobel Oak wouldn’t be complete without mentioning the best selling shoe cupboard. 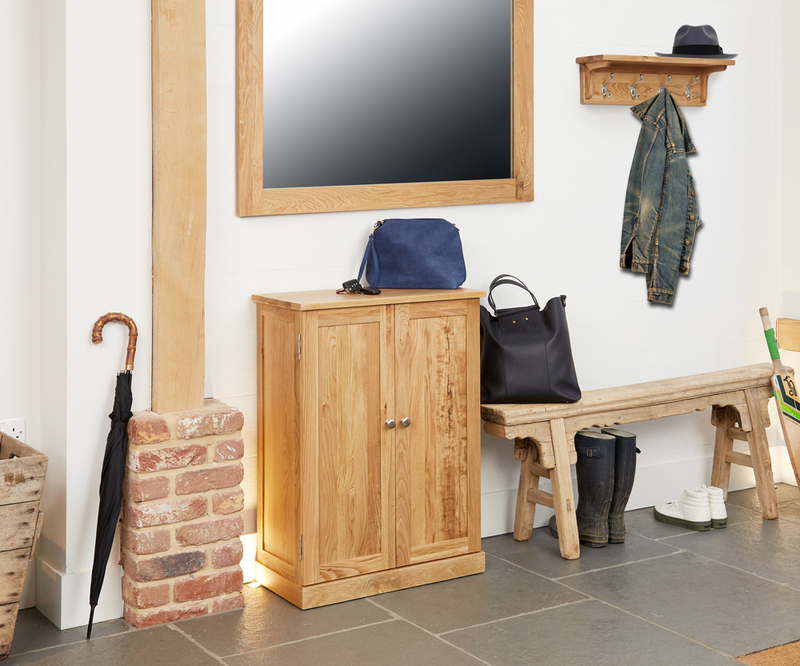 Keep the whole families shoes neat, tidy and together in pairs in this attractive Mobel Oak shoe cupboard. Built to last, behind the paneled doors you’ll find enough racking to store slippers and sneakers alike. A durable varnish brings out the grain pattern of the wood while the brushed steel door knobs are a stylish finishing touch. The cupboard is a beautiful addition to any hallway. Feeling #houseproud? 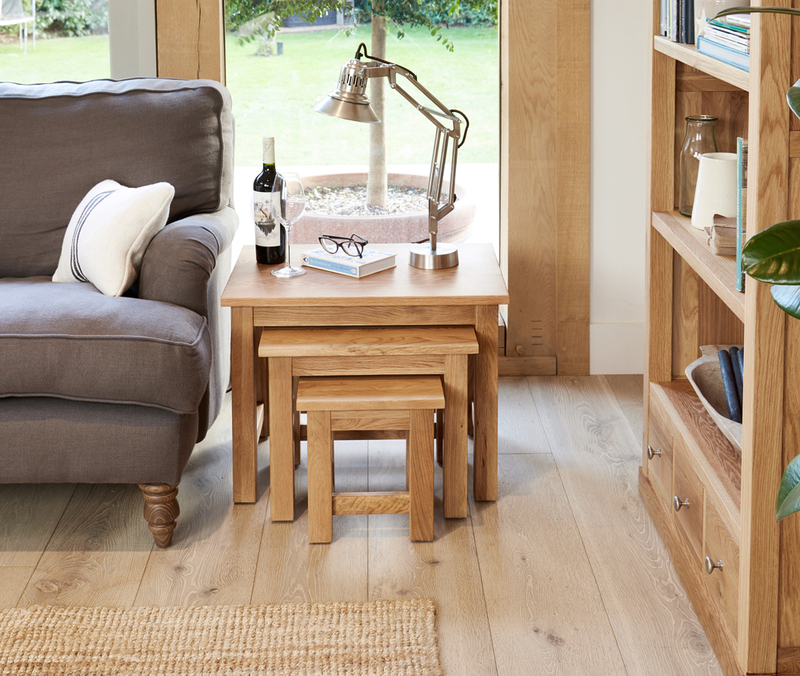 Then just click here to view all the Mobel Oak range with new photography. The most versatile furniture you’ll ever own…. ?